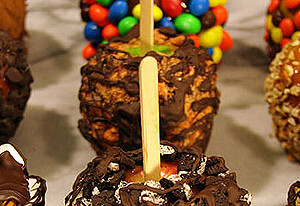 Categories: Holidays, Rosh Hashanah, Chocolate, Chocolate Covered Fruit, Nuts & Fruits, Chocolate Dipped Fruit, Green. Tags: apple, belgian chocolate, candy, caramel apple, chocolate, chocolate dipped, chocolate dipped apple, dark, decadent, elegant, fun, gourmet, granny smith apple, hand dipped, katz, sweet, Tart. Tart Granny Smith Apple covered in a smooth non – dairy caramel and then hand dipped in The Chocolate GIRL’s, rich blend of Dark Belgian Chocolate and if that’s not enough it is then drenched and drizzled in your favorite topping.